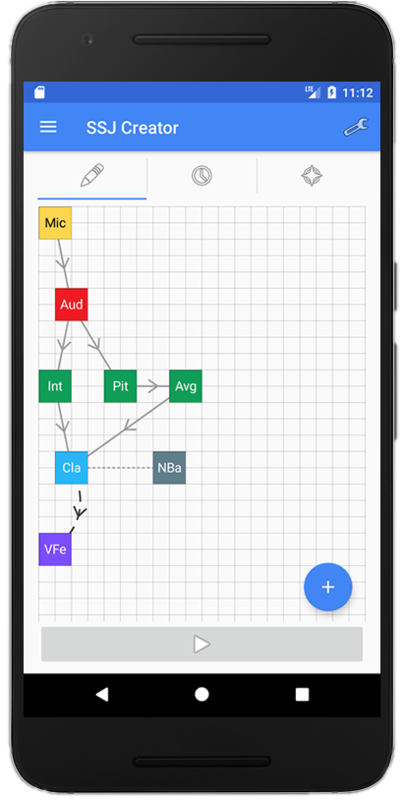 SSJ is an extensible android framework for social signal processing in an out of lab envirnoment. It packages common signal processing tools in a flexible, mobile friendly Java library which can be easily integrated into Android Apps. SSJ Creator can be downloaded from the play store. SSJ has been inspired by the OpenSSI framework. SSJ is not a one-to-one port of SSI to Java, it is an approximation. Nevertheless, it borrows a lot of programming patterns from SSI and preserves the same vision for signal processing which makes SSI great. It than packages everything in a flexible, mobile friendly Java library which can be easily integrated into Android Apps. This library is free software; you can redistribute it and/or modify it under the terms of the GNU General Public License as published by the Free Software Foundation; either version 3 of the License, or any later version. This library is distributed in the hope that it will be useful, but WITHOUT ANY WARRANTY; without even the implied warranty of MERCHANTABILITY or FITNESS FOR A PARTICULAR PURPOSE. See the GNU General Public License for more details.